You should be aware of any known issues regarding Net Folders. For more information, see Net Folder Issues in the Novell Filr Readme. It is important that you understand the purpose, rights requirements, expected user name format, and character restrictions associated with the Net Folder Server proxy user before you configure a Net Folder Server. 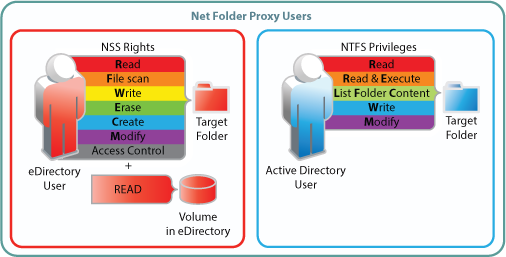 The Net Folder Server proxy user is used to read, write, create, and delete files on your corporate OES, Windows, or NetWare file servers on behalf of users who do not have native rights to the files, but have been granted rights via a Share in Filr. For example, User A has native Read and Write access to a file on an OES server, and User B does not have any native access to that file. User A shares the file with User B in Filr and grants User B Read access. User B can now view the file within Filr because the Net Folder Server proxy user is giving User B the ability to read it, because of the Share. If User B tries to access the same file directly from the OES server, he does not have sufficient rights. Users with native rights to files do not use the Net Folder Server proxy user. The Net Folder Server proxy user is not the same as the LDAP proxy user used to synchronize users and groups (as described in User DN (Proxy User for Synchronizing Users and Groups)). IMPORTANT:When using Distributed File System (DFS) namespaces, the proxy user name format must be domain\user. For example, acme\administrator. Proxy names that contain special characters are not supported. For example, admin is supported, and @dm!n is not. Other special characters that are not supported in the proxy name are / \ [ ] : | = , + * ? < > @ ". It is important that you understand what to expect when configuring access rights for Net Folders. Furthermore, the access rights that you define on a Net Folder affect how items can be accessed by users who receive shares to items in the Net Folder. After you assign users rights to the Net Folder, users are granted the same level of access rights that they currently have on the file system. If you assign users access rights within the Net Folder and those users do not already have file system rights, they are not able to see files and folders within the Net Folder. In the Shared with Me area: All users who receive a share. When you synchronize files in Net Folders, only file metadata is synchronized. Whether or not the content of files is brought into Filr is determined by the index settings that you choose when creating a Net Folder, as described in Section 5.4, Creating and Managing Net Folders. Files must be synchronized before they can be indexed. When you configure Net Folders, you have the option to use one or both of the available synchronization methods (Full synchronization or Just-in-Time synchronization). Depending on the nature of your data, it might make sense to use full synchronization on some of your Net Folders, and Just-in-Time synchronization on other Net Folders. You might want to use a combination of both methods of synchronization for other Net Folders. Full synchronization: Synchronizes all files from a given Net Folder either at a schedule that you specify or from a manual action. All files are examined for changes, and any changes are then synchronized. This type of synchronization ensures that all files are synchronized; however, it is more time-consuming and resource-intensive than Just-in-Time synchronization. For information about the time required to perform a full synchronization on a Net Folder, see Section 5.1.7, Planning the Amount of Data to Synchronize. Just-in-Time synchronization: Synchronizes individual files at the time users access the files. Only files that are accessed are synchronized. Allows you to make files available to your users without needing to wait for all files within a given Net Folder to synchronize. Only those files that users want access to are synchronized. A file is synchronized to Filr at the time the user accesses the file within Filr. Users do not have to wait for files to synchronize based on the Net Folder synchronization schedule (which by default is every 15 minutes). Now if one user edits a file and saves it, another user who views the file only a few seconds later will see the recent change. For more detailed information about Just-in-Time synchronization, as well as how to enable it, see Section 5.6, Enabling Just-in-Time Synchronization. Whether or not your data never changes (static) or is constantly changing (dynamic) should influence the type of synchronization method that you implement for the Net Folder. Full synchronization is more suited for static content, while Just-in-Time synchronization is more suited for dynamic content. For example, a Net Folder that contains static files, such as medical records that are read-only, might be best synchronized to Filr by running one manual synchronization and disabling the scheduled synchronization as well as the Just-in-Time synchronization. The files could then be accessed via Filr without any unnecessary load being placed on the Filr system. Conversely, a Net Folder that contains dynamic files that users actively collaborate on, such as marketing documents for a company’s current products, might be best synchronized to Filr by enabling Just-in-Time synchronization. Users would then always have the latest information when they access a file. In some cases, you might want to enable both scheduled synchronization as well as Just-in-Time synchronization. In such cases, consider also the amount of data that is located on the Net Folder. The amount of data on the Net Folder should influence the type of synchronization method that you implement because of the system resources that are required to perform a scheduled synchronization. If a Net Folder contains a large amount of data, a scheduled synchronization might consume a large amount of system resources more frequently than is necessary. If you have a large amount of data but still want the data to be searchable, you might consider running one full synchronization so that you can then index the data, then use Just-in-Time synchronization thereafter. Whether or not you want data to be immediately searchable might influence the type of synchronization method that you implement for the Net Folder because data cannot be indexed (and therefore is not returned in searches) until after the data is synchronized. In a full synchronization, the synchronization process begins when you configure the Net Folder. In a Just-in-Time synchronization, the synchronization process begins on a per-file basis only after a user accesses a file for the first time. After a file is accessed for the first time, the file is synchronized and is then indexed. NOTE:File indexing is disabled by default. You must enable file indexing for a given Net Folder if you want the files in the Net Folder to be searchable. You enable indexing during the creation of the Net Folder, as described in Section 5.4, Creating and Managing Net Folders. The Filr desktop application triggers Just-in-Time synchronization only for the top-level folder that the user has chosen to synchronize (not the entire folder tree), and it is triggered only when Personal Storage has been disabled. For all sub-folders, files must already be synchronized and accessible via the Filr web interface. If your users are using the Filr desktop application, it is best to run one manual synchronization and/or enable the scheduled synchronization of the Net Folder or Net Folder Server. If you don’t, the Filr desktop application might not download all of the files in the Net Folder. You can configure Net Folders and Net Folder Servers to be synchronized at a schedule that you specify. Synchronization in this sense means that content is simply mirrored in Filr; it is not transferred from the remote file server for replication on the Filr storage. Only metadata such as the name, path, owner, trustees, and so forth is actually stored in Filr. Synchronizations can be scheduled only if you have configured the Net Folder or Net Folder Server to perform full synchronization as the synchronization method (as described in Section 5.1.4, Planning the Synchronization Method). When a schedule is configured on a Net Folder Server, all Net Folders associated with that Net Folder Server are synchronized on the same schedule. However, if you configure a separate synchronization schedule for an individual Net Folder, this schedule is used for synchronizing the Net Folder, instead of the Net Folder Server synchronization schedule. You configure Net Folder synchronization schedules among various Net Folders and Net Folder Servers in such a way so that Filr is constantly synchronizing information. A single synchronization schedule is so frequent that a new synchronization begins as soon as the previous one finishes. HINT:If you have a Net Folder or Net Folder Server that contains hundreds of thousands of files, consider doing only one initial Full Synchronization (if you need all of the file content to be indexed and searchable), and using Just-in-Time synchronization as the ongoing synchronization process. Performing a full synchronization on a Net Folder can consume a significant amount of resources on your Filr appliance. If you plan to synchronize thousands of files via Net Folders, you should configure a clustered Filr system that includes multiple Filr appliances. For more information about how to configure clustering, see Planning a Multi-Server (Clustered) Filr Configuration in the Novell Filr 1.0.1 Installation and Configuration Guide. For more information about how to set aside a Filr appliance, see Setting Aside a Filr Appliance for Re-Indexing and Net Folder Synchronization in a Clustered Environment in the Novell Filr 1.0.1 Installation and Configuration Guide. Depending on the number of files that exist in a volume or share on a file server, it is likely unwise to create a single Net Folder at the root of a volume or share. Instead, create multiple Net Folders. With multiple Net Folders created, you can be more flexible with the way you administer the Net Folders, such as the synchronization methods that you use and the rate at which you synchronize data. The Filr appliance and any file servers that the Filr appliance connects to via a Net Folder should be synchronized to the same time and to the same time zone. You configured the time zone of the Filr appliance during the appliance installation, as described in Installing the Filr Appliance in the Novell Filr 1.0.1 Installation and Configuration Guide. If time zones are not synchronized in this way, users might see conflicting creation and modification times for files.